I am Wang Shuping, and, as a doctor and epidemics researcher, I was the one who first discovered Hepatitis C virus and HIV contamination in plasma collection stations mushroomed in China in the 1990s. Hundreds of thousands of innocent people became infected as a result. Twenty years have passed since those frightful discoveries, the current state of blood safety in China, to my dismay, still presents an alarming picture of continuing transmission of HIV and HCV through blood. On World AIDS Day today, I would like to call attention to the matter to raise the public’s awareness and warn the policy makers. 3. Use of contamination of blood products. In recent years, there have been scattered reports in Chinese media on the spread of HIV and HCV through blood transmission. HCV and HIV transmission in connection to blood giving: A 2005 survey of blood donors in southern Jiangsu province found that 43.24% (797/1843) were HCV carriers, while the percentage among non-blood donor group was 3.05% (48/1572). According to Wei Wei, who tested 604 paid blood donors in 2006, found the HIV and HCV carriers were 8.94% and 40.89% respectively, much higher than non-blood giving population. Yinchuan News Online reported on January 20, 2010, that more than 80 people were infected with HIV when they received blood transmission in a hospital in Dayan, Hubei province. In a paper published in 2006, researchers studied 1,180 villagers aged two and older in a village with high rate of AIDS cases via blood transmission in central China, and found HIV infection rate was 15.34% (181/1180), but among people who have been paid blood donors, the rate was as high as 38.3% (167/430). In a paper published in 2011, the author Wei Wei points out that, in 1995, all 32 HIV carriers in the city of Xinyang, Henan, had been infected in the course of blood donation. Over the years, there have been more cases of sexual transmission and fewer cases of blood transmission, but as recent as in 2010, still 28.86% of HIV infections was transmitted through blood. In August 1, 2011, authorities in Guizhou province closed down 16 Plasma Collection Stations. People gave conflicting reasons for the closure, but an interviewee told People’s Daily Online that some hemophilia patients he knew were infected with HIV from use of plasma products. Normally, government shuts down blood stations out of health concern. In Guizhou’s case, officials gave no explanation for the shutdown, but the province has been seeing higher number of HIV infections in recent years. Infection among hemodialysis patients: In November, 2009, 19 patients receiving hemodialysis in Huoshan, Anhui province, were reported to have been infected with HCV during hospital treatment, or 32.76% of all hemodialysis patients. According to a Xinhua report in January, 2010, of the 77 patients receiving hemodialysis in Yicheng Hospital, Hefei, 39 were found HCV positive. Doctor Yang Bin at the Third People’s Hospital in Chengdu investigated 423 hospitals for HCV infection among hemodialysis patients between March 10 and April 10, 2010, and found 7.01% (1506/21470) were HCV positive. Before, in July, 2006, Dr. Yang had reported that, his study of 40 patients, who had been receiving long-term hemodialysis, found the HCV infection rates are 11%, 27.7% and 50% respectively for those in treatment for one year, two years and three years, an exponentially increasing risk for long-term patients. Infection from unsafe injection: In November, 2011, Xinhua News Agency reported that, in a rural town in Bozhou, Anhui province, 56 people, mostly children, were found HCV positive who had shared the same syringe. In connection to the incident in Anhui, 104 people in Yongcheng, Henan province, were found HCV positive around the same time. In a township in Heyuan, Guangdong, 242 people were found HCV positive over the course of four years. The same report pointed out that, from 2005 to 2011, the number of HCV positive had gone up nation-wide, while Xinhua reported in July, 2011 that 40 million in China were HCV positive, about a quarter of total infections around the world. My estimation is that these reports are merely the tip of the iceberg. Since there are a large number of people who have been carrying HCV and/or HIV since the 1990s, the viruses can spread very fast among healthy people, just like Hepatitis B did, if no emergency measures are taken to prevent it. Infection from use of contaminated blood products: During the 1990s, multiple blood products reported HCV contamination, including human normal immunoglobulin, placental globulin, plasma albumin, fresh plasma, and plasma immunoglobulin (my own study). It remains unknown as how many adults and children were infected with HCV through use of blood products. In 1995, the director of a plasma collection station in Shenqiu, Henan, told me that there were several cases of HIV positive in the plasma they had sold to Shanghai RAAS Blood Products Co., a Chinese-American joint venture. Fortunately Shanghai RAAS performed test on their purchasing and caught the contaminated blood, but they made no report on the contamination. In 1996, HIV was found in the albumin sold by China’s Air Force Blood Product Factory based in Zhengzhou, Henan. At the time, most of the blood product makers did not screen for HIV, including Shanghai Institute of Biological Products Co., China’s largest blood product maker. In Shanghai in early 1990s, 55 hemophilia patients were infected with HIV after using the company’s freeze-dried human coagulation factor, but as the report pointed out, no one knows how many of China’s 120,000 hemophilia patients in China have been infected with HIV. In January, 2007, several liver transplant patients in Beijing Chaoyang Hospital who had been tested HCV negative were found HCV positive after operations. The hospital zoomed in on the human immunoglobulin for intravenous injectionmade by Guangdong Baiyi Pharmaceutical Co. Testing found that, of the 47 patients who had used the injection, 6 were positive before use, 1 whose sample was not collected for some reason, and the rest—40 of them—all tested positive. The product was subsequently recalled, and the government investigated the case. But it was unclear how many hospitals and how many patients across China had used blood products from this maker. In the 1990s, Henan province alone had about 400 plasma collection stations, and following the HIV epidemic, 378 were closed down. Nationwide, there could have been over 10,000 stations at one point. Currently, China has about 33 blood product makers and 145 plasma collection stations, according to multiple sources. In Guangdong and elsewhere, plasma collection stations are being re-opened in rural areas. But such control has been relaxed. 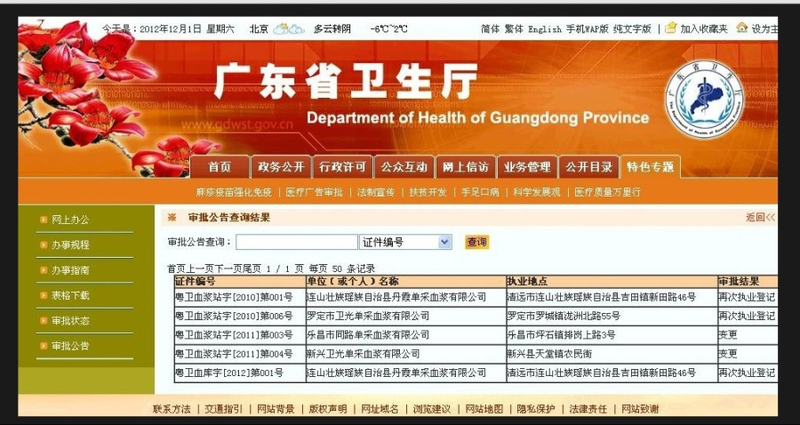 The Ministry of Health issued a notice in January, 2012, to “encourage the establishment of plasma collection stations nationwide, especially in the east part of the country,” to ease shortage of blood products in China. Based on information I have found and presented in this article, HIV and HCV spread through blood transmission is still very serious in China, and the new round of development of plasma collection stations is of great concern to me. Incidentally, China saw a 10% hike in HIV infection this year from last year. Given the medical conditions in current China, I believe it is a wrong policy to expand plasma collection. I am also concerned with possible abuses where, as in the 1990s, plasma collection once again becomes a profit-seeking route for some unscrupulous health officials and medical professionals on local levels, thus having devastating consequences for some of China’s most vulnerable people.